The nine decades of Yayoi Kusama's life have taken her from rural Japan to the New York art scene to contemporary Tokyo, in a career in which she has continuously innovated and re-invented her style. 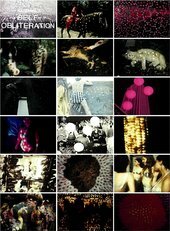 Well-known for her repeating dot patterns, her art encompasses an astonishing variety of media, including painting, drawing, sculpture, film, performance and immersive installation. It ranges from works on paper featuring intense semi-abstract imagery, to soft sculpture known as 'Accumulations', to her 'Infinity Net' paintings, made up of carefully repeated arcs of paint built up into large patterns. 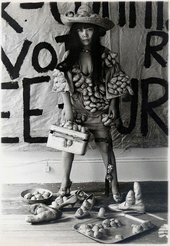 Since 1977 Kusama has lived voluntarily in a psychiatric institution, and much of her work has been marked with obsessiveness and a desire to escape from psychological trauma. 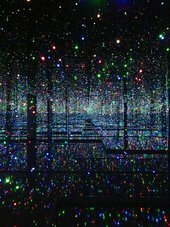 In an attempt to share her experiences, she creates installations that immerse the viewer in her obsessive vision of endless dots and nets or infinitely mirrored space. At the centre of the art world in the 1960s, she came into contact with artists including Donald Judd, Andy Warhol, Joseph Cornell and Claes Oldenburg, influencing many along the way. She has traded on her identity as an 'outsider' in many contexts – as a female artist in a male-dominated society, as a Japanese person in the Western art world, and as a victim of her own neurotic and obsessional symptoms. After achieving fame and notoriety with groundbreaking art happenings and events, she returned to her country of birth and is now Japan's most prominent contemporary artist. 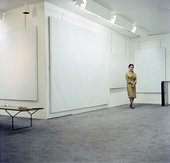 This is a varied, spectacular exhibition of a truly unique artist. There has never been an exhibition of this size of her work in the UK and this is an unmissable opportunity for both Kusama fans and those new to her work.